sDo you want a break from soup, chili or the ‘usual’ Halloween fare? 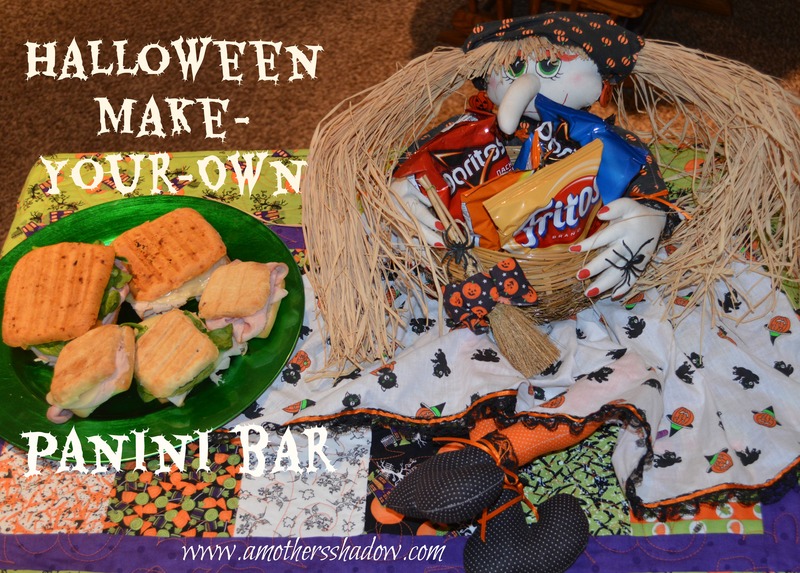 Halloween Make Your Own Panini Bar is a great option! 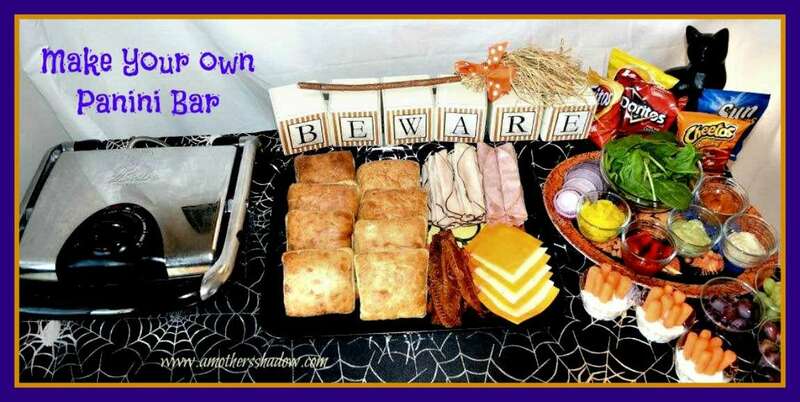 This is a perfect way to allow your guests as they come Trick or Treating to make their own, hot sandwich. And you can enjoy the party since all the prep work is done ahead. It’s easy, put out what you’d like for available ingredients and enjoy the festivities! Small Ciabatta rolls, or any crusty rolls work really well. Small is best to avoid waste. It’s also a good idea to have gluten free variety if you know that will be useful. 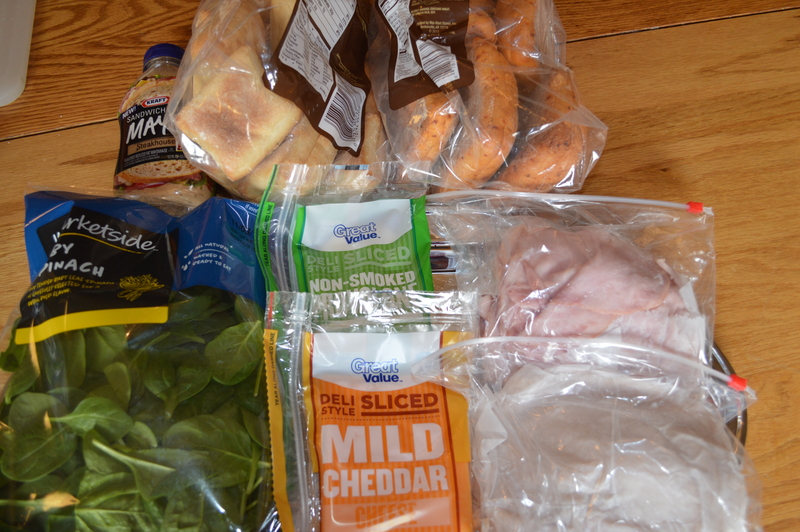 Have the ingredients ready for people to make their own panini. Make sure the meat, cheese and condiments are over ice, or kept chilled – never left out to spoil during the course of the evening or party. 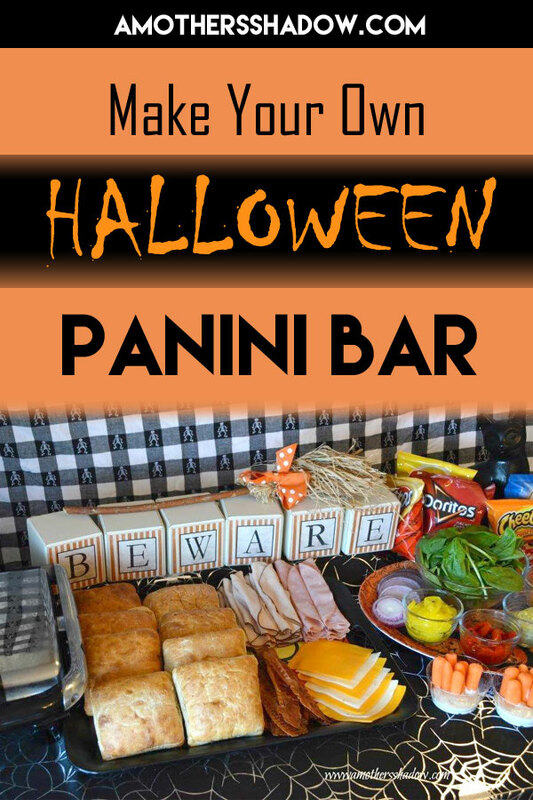 When people arrive, or are ready to eat, they can assemble their panini to their liking with the meat and cheese they want. 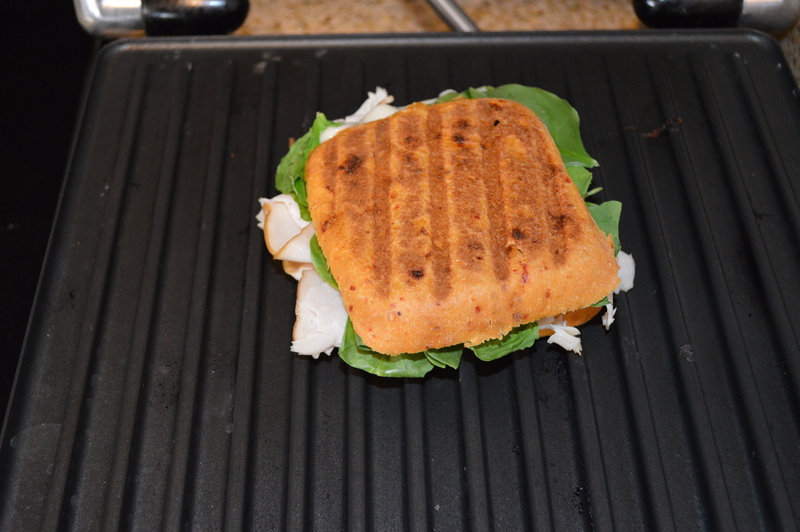 Simply put it together as desired, then into the panini maker/press and heat completely through. *** Before heating through – or after, whichever is preferred – add in any of the condiments and toppings desired. There were a variety of the small bags of chips available to suit everyone’s choice. Cups with ranch dressing and carrots were all ready to go; you could also include celery sticks. Cups of green and purple grapes were handy to snag as guests helped themselves. I purchased the smaller Ciabatta buns in the store to avoid waste. You can use any denser type roll you like. For the meat I put out deli sliced ham, turkey (forgot to include the roast beef in the pic, oops) and also precooked bacon strips. Keep on ice if it is to stay out for an extended length of time. Cheeses are so varied, but I settled with cheddar and Munster. On the tray for condiments included: fresh spinach leaves (I like it better than lettuce on these), thin sliced red onion, mild pepper rings, roasted red bell pepper, and sandwich spreads (you can purchased these from the store *if mayo based keep on ice if out for an extended amount of time). My Jalapeno and Red Pepper Jelly is AMAZING and my favorite condiment on a panini and so many other things. 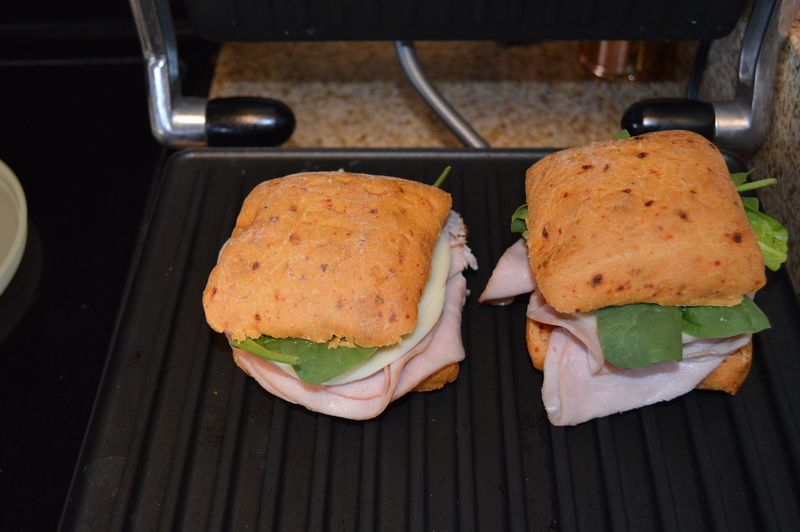 As guests put their sandwich together, they could eat it cold or heat/grill it on the panini maker and ta-da! Magically they had their own scrumptious meal to eat as they visited, or to take on the go. Just use whatever is available in your price range and relax, they’ll make their own dinner – which is always the best part!! !